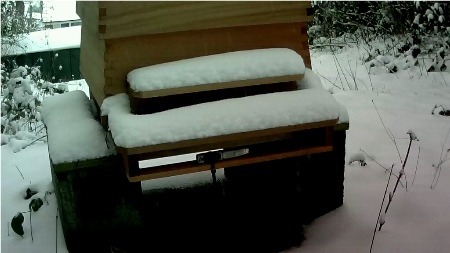 Click on the link below to open a new page for the live web cam. The camera is powered 24hours a day, there are a limited number of feeds from the camera, try back later if you don't get a picture. For those that like a little extra control of the camera have a look here. This link connects directly to the camera and using the login details 'user' & 'user', after installing a 'driver' for the camera you can have more control/options. Simply put, you can move the camera around easier. This may not work with all web browsers though. Enjoy. 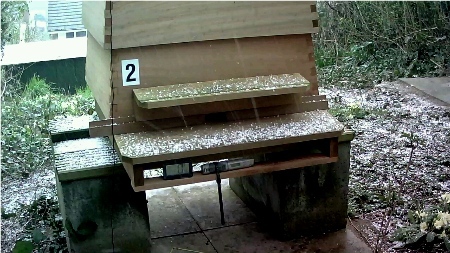 You can move the camera around to see all the beehives, as of the end of 2013, there are 2 wooden WBC hives, 1 polystyrene National hive, a 14x12 nuc and if you look carefully behind hive 2 there is a small mating apidea. 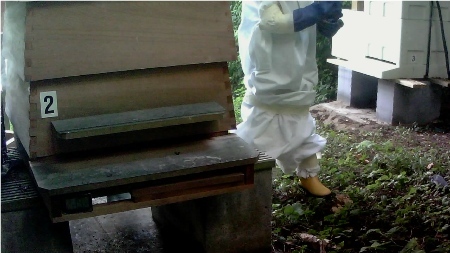 If you are lucky you may even see me carrying out an inspection of the hives. Typically I carry this out at weekends during the period between April and October. 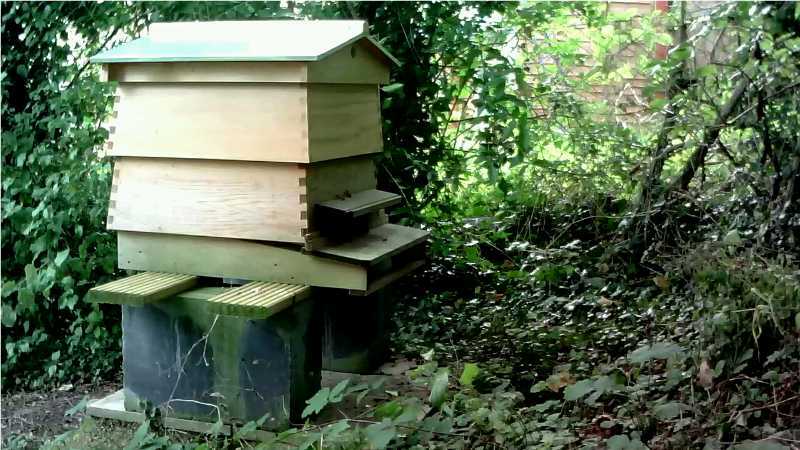 The two pictures below (and the others on this page) are taken directly from the webcam, they show both of the hives on the 07 October 2012. Click on either to bring up the full picture. 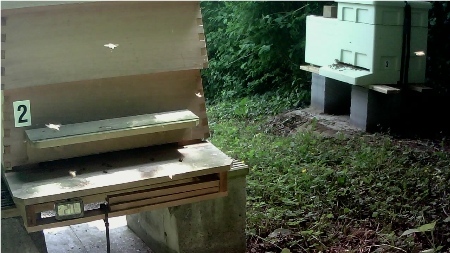 Hive number 2 is on the left, hive number 1 on the right. 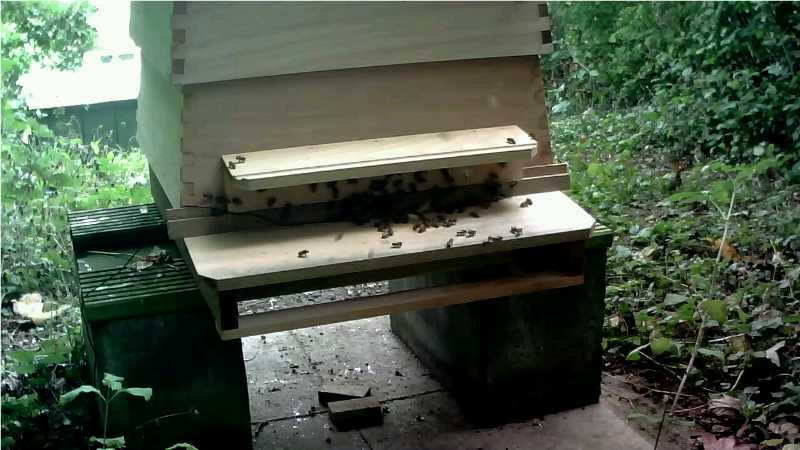 Both hives have now been clearly numbered, this is visible on the webcam link. Don't expect much to be happening over the winter period. The bees are tightly packed together to keep warm. On days when the temperature reaches around 8°C the bees will be out foraging. 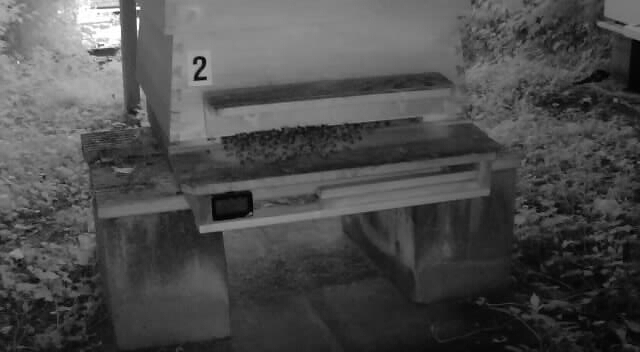 During the summer however, the bees will be very active, even at night- when they 'hang' around the entrance to control the hive temperature. The camera has built IR led's that automatically turn on to allow night time viewing. The 'webcam' is actually a HD 720p pan and tilt IP camera (Foscam model FI8920W). For those interested in finding out more about this capable IP camera and others, follow this link. If you want to know a little more on how I have wired up the camera, see this powerpoint presentation that I gave to my fellow MBKA beekeepers at one of our meetings. (please note that the presentation is around17MB as it contains a number of photos). The pictures above were taken on 26th June 2013, the first early evening and the second around midday. The picture below was taken in August 2013, it features my son in a rather large beesuit helping out on an inspection.